Ah, zebra stripes. The envy of all. Nothing says class like wearing some faux zebra stripe as you strut down the boulevard. "Hey," it says, "I'm better than you because I'm zebra stripes and you're something boring." Obviously the perfect choice for any pimp ready to flash his wealth in front of the common people. When it comes to pimping, we're told it ain't easy. And the outfit makes the man. So if you want to convey your high pimp status, you'll need this outfit. And if you ever run into a herd of zebra, angry that you've taken one of their kind for your clothing? Well, you just look those zebras in the eye and you remind them who's boss. It's you and you've got the velvet and zebra suit to prove it. Those zebra better scram if they don't want to end up as your rug. Besides the zebra stripes, we're talking about crushed velvet. Yes, crushed. None of this faux non-crushed velvet. Pssh, yeah right! You wouldn't be caught dead in non-crushed velvet, and if any of your pimp friends saw you in it, you'd be the laughingstock of the neighborhood. No, you paid extra to have your velvet crushed so it's nice and soft for the ladies. And you don't even leave out the hat when it comes to that crushed velvet. 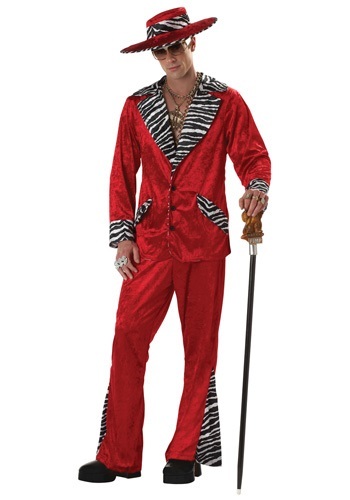 Yeah, some lesser pimps wouldn't bother to velvet and zebra stripe their hat, because they're not true pimps. You? You know better. You put velvet and zebra on everything. It sends a clear message, just like you while you swing that cane. Big pimpin'.